Suboxone is a medication prescribed for opiate dependence that is made of two medications- buprenorphine and naloxone. Buprenorphine is called an opioid “partial agonist,” which means it partially binds to the opioid receptors in the brain, but not to the same degree as other opioids. Buprenorphine tricks the brain into believing it has encountered a full opioid such as oxycodone or heroin. It produces less euphoria and physical dependence, has a lower potential for misuse, and also has a ceiling effect (you will not become tolerant to, or need more to produce the same effect.) 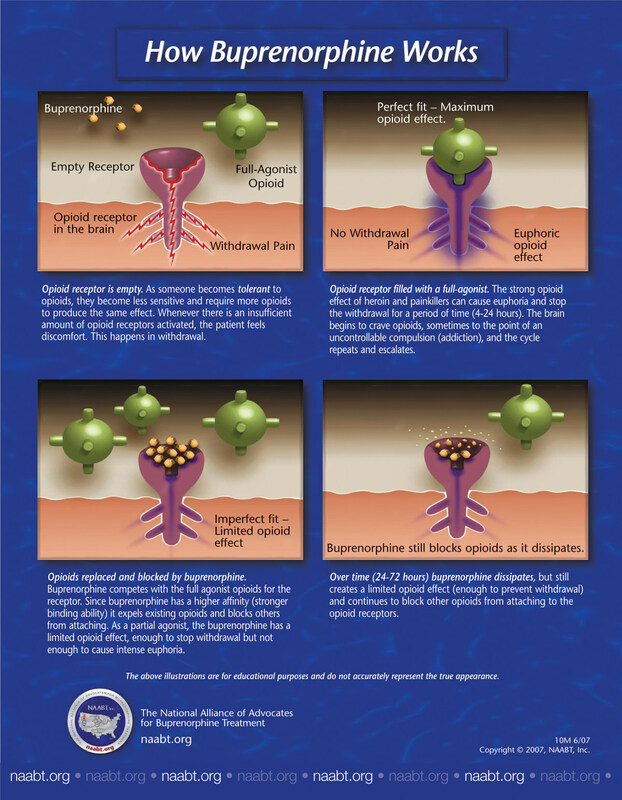 Naloxone blocks or reverses the effects of opioid medications, including buprenorphine. These two medications used in combination help ease withdrawal symptoms and combat cravings. Patients report that Suboxone “make them feel normal” again; during the time spent on Suboxone, patients participate in chemical dependency counseling and other behavioral therapies to assist the patient in long-term recovery. Typically, a patient can start taking Suboxone 24 hours post-use and will receive relief shortly after. ***Patients who use Suboxone ARE NOT “trading one addiction for another”- please read why in our blog here: Is Suboxone Trading One Addiction For Another? We understand that once a patient is ready to begin their recovery using Suboxone, we must act fast. In most cases, patients are able to start the treatment process on the very day they’re asking for help. All necessary clinical assessments and office requirements for Suboxone maintenance are conducted at this appointment in order to introduce medication immediately. The patient may be able to see their counselor this day whether it be in person or via tele-counseling; if not, they will leave with a scheduled first appointment. Dependent upon each individual patient case will determine when you’re asked to return for a follow-up, but can always expect within 3-7 days. Each patient has their own individualized treatment plan, developed by themselves and the doctor consisting of chemical depending counseling (individual or groups), mental health services (if needed), support meeting guidance and other behavioral therapy approaches to be completed on an ongoing basis on their own time. We continue to monitor the patient’s progress on a weekly, then bi-weekly basis until the patient is stable, engaging in all aspects of their treatment plan and genuinely doing well. If a patient has setbacks we move them to a higher level of care with more frequent office visits, urine screening and modification of the treatment plan until they have once again stabilized. We believe each patient is a unique individual with a specific set of needs that must be met in order to have the best chance for lifelong recovery.